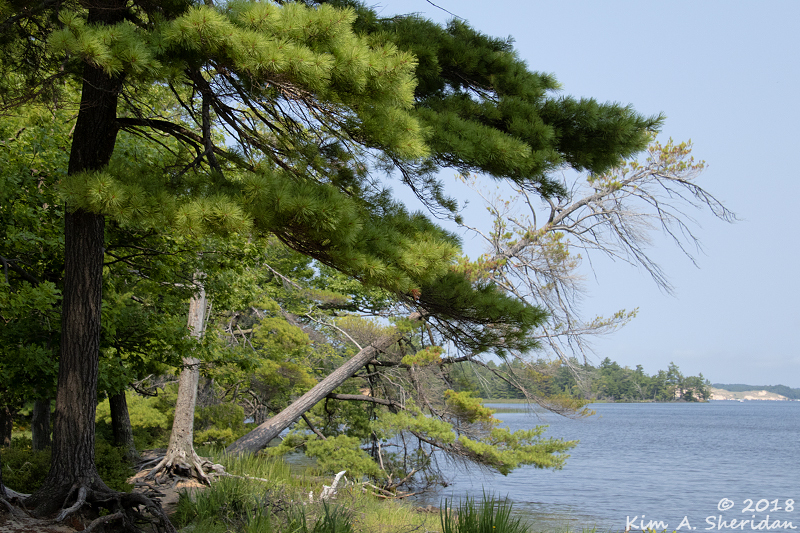 Nearby Ludington State Park has a number of great trails, all of them tempting. It’s tough to choose between them! I don’t spend much time on the decision. On this trip to the park, I walked my favorite loop, for the umpteenth time. Not to worry, there’s always interesting things to see on the Lost Lake, Ridge and Island Trails. Three trails, three lakes, and me caught between them, caught in all their wonder. The day began on the Lost Lake Trail, along the western shore of Lost Lake. First trail, first lake. 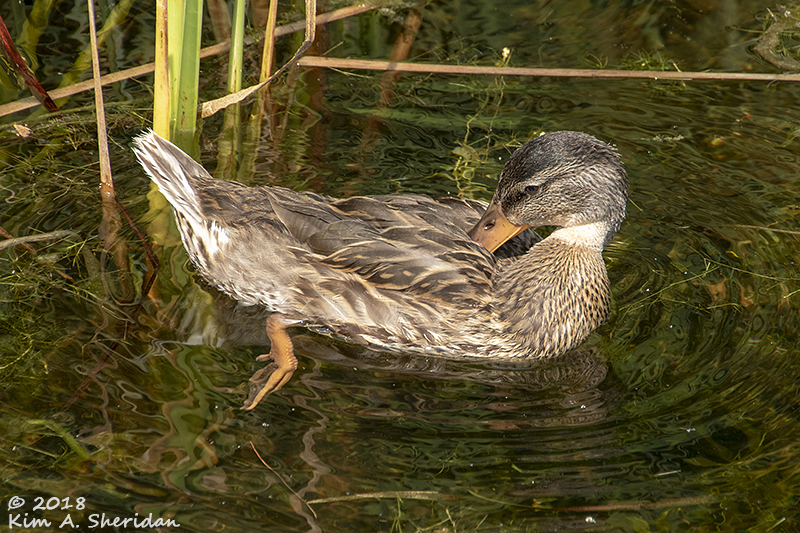 I lingered on the boardwalk, watching a female Mallard preoccupied with her beauty routine. 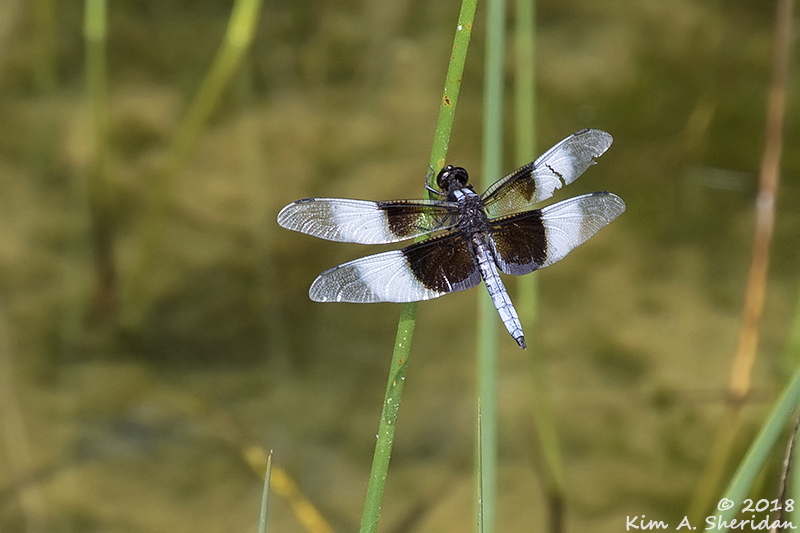 Nearby, a Widow Skimmer perched, dazzling in the sunlight. 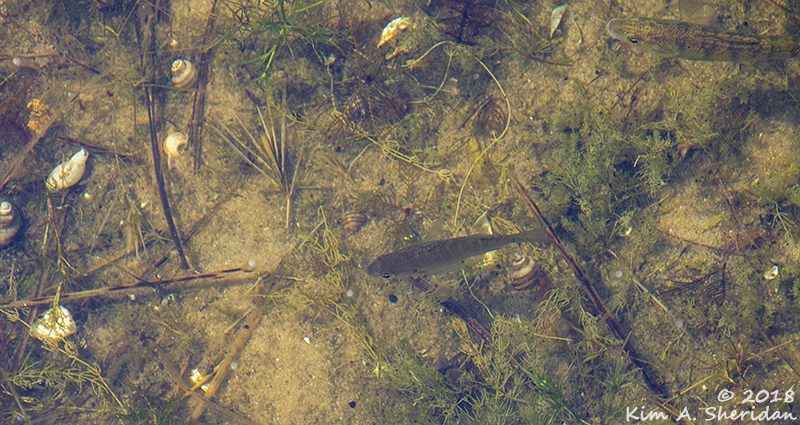 Below the water’s surface, I spotted small fish swimming. If I looked hard enough, I could see the snails on the lake bottom. See them? 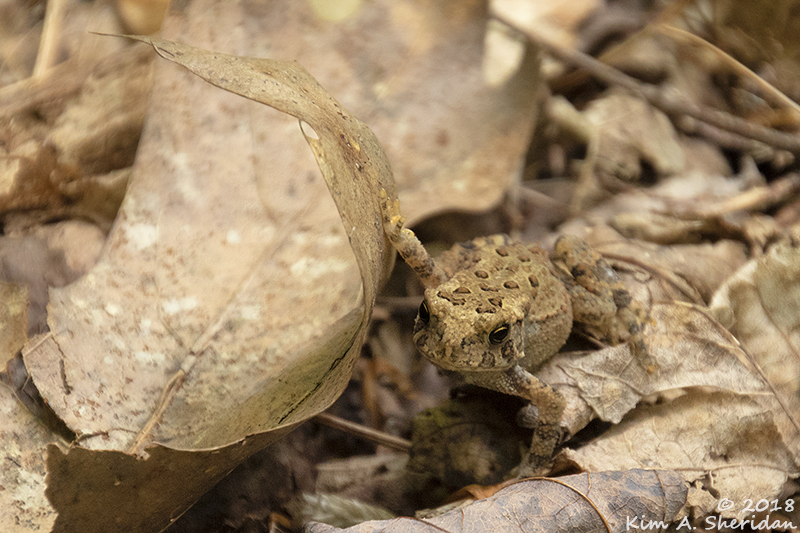 I had to look even harder to see this brown American Toad, perfectly camouflaged amid the brown leaves. He pushed that leaf up like a manhole cover, just to get a peek at me. Soon the trail left the boardwalk and climbed up to the top of the sand dune. This dune is heavily forested in white pine, beech, maple and birch trees, with heath and mosses carpeting the ground. 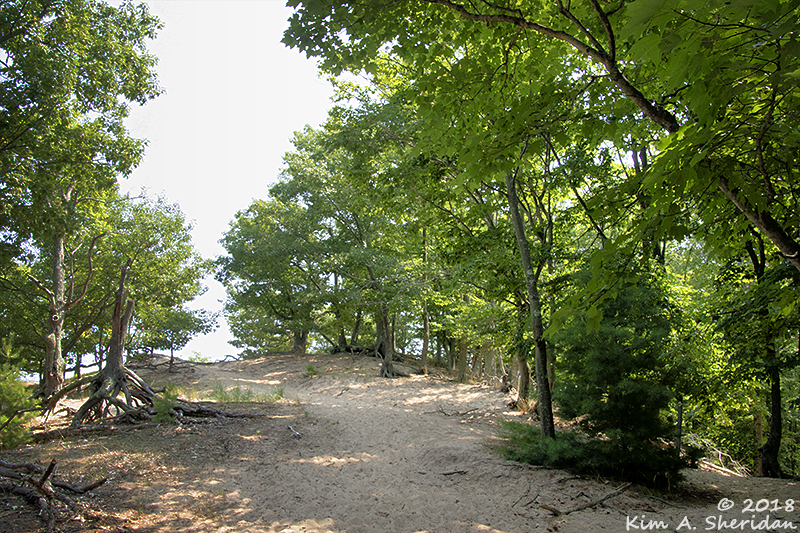 Here the Ridge Trail followed the ridgeline along Lake Michigan. Second trail, second lake. 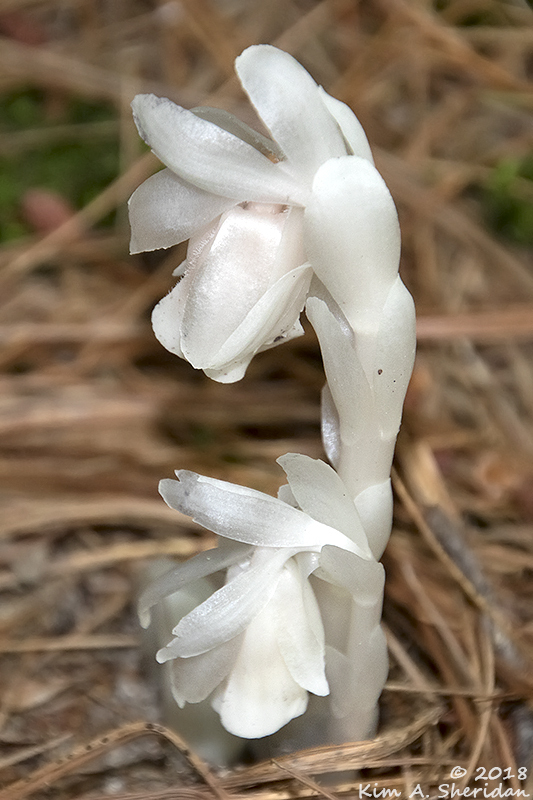 As I walked along the bluff, I was delighted to find my favorite new plant, Indian Pipe. Yes, that’s a plant. No, it’s not green. It doesn’t photosynthesize like other plants. It’s parasitic, and feeds on certain types of fungi that have a symbiotic association with the root system of trees. 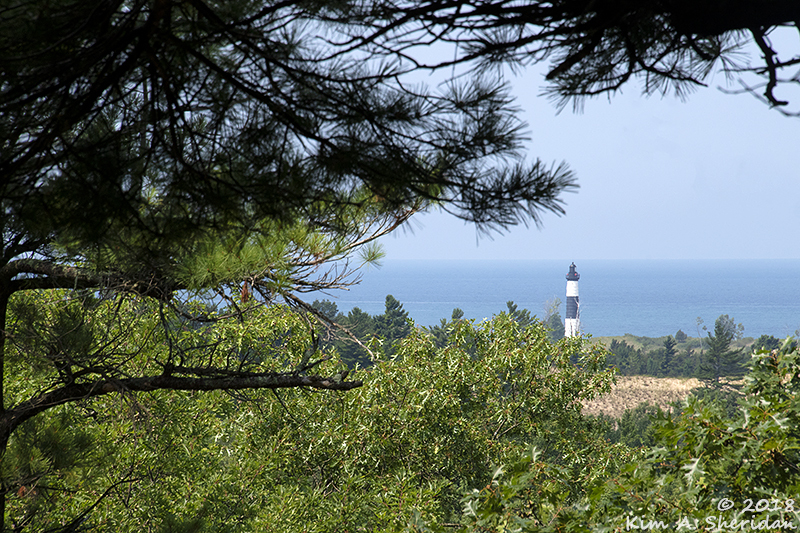 In several places, the white pine trees thinned enough to allow a peekaboo view over more dunes to Lake Michigan and the Big Sable Lighthouse. The path made a sharp U-turn, leading back along another ridge, around a deep valley between the dunes. Beyond white pines and scattered beech trees, a side trail beckoned. I bypassed it, knowing from past trips that beyond the crest, lines of open dunes march off toward the horizon. The main trail dropped down from the ridge, through the forest, until it reached the shores of Hamlin Lake. Here it became the Island Trail as it crossed the small islands and narrow spits that separate Lost and Hamlin Lakes. Third trail, third lake. 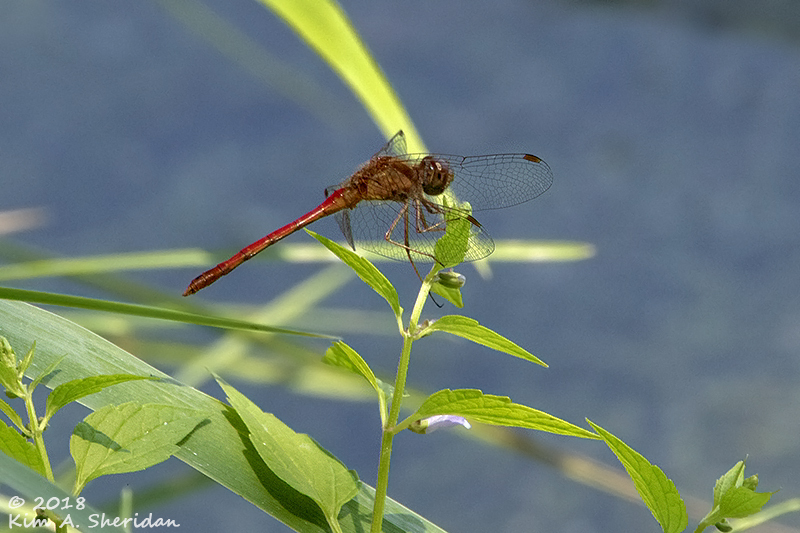 I found an Autumn Meadowhawk chillin’ out at my favorite lunch spot. Up and down on the edges of the lake the trail led, and across a long boardwalk through grassy wetlands. Every few footsteps brought the splash of a startled frog diving for cover. I was never quick enough to spot one. 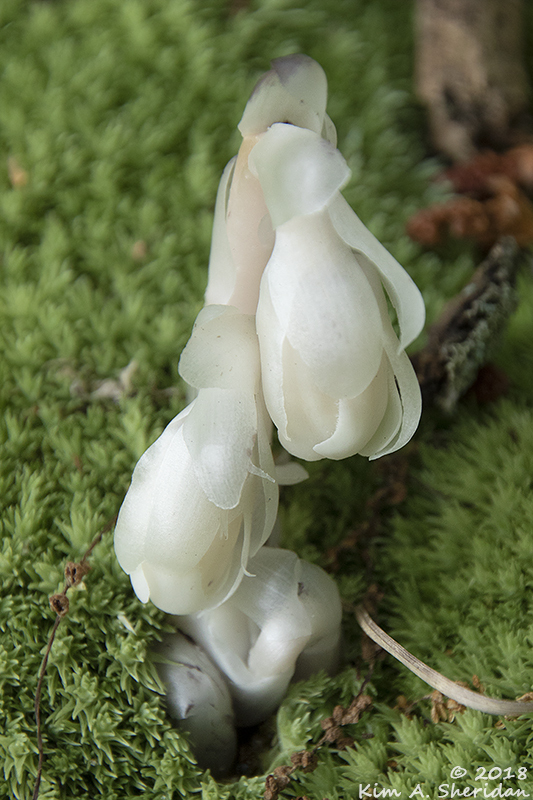 So I took more photos of another Indian Pipe. 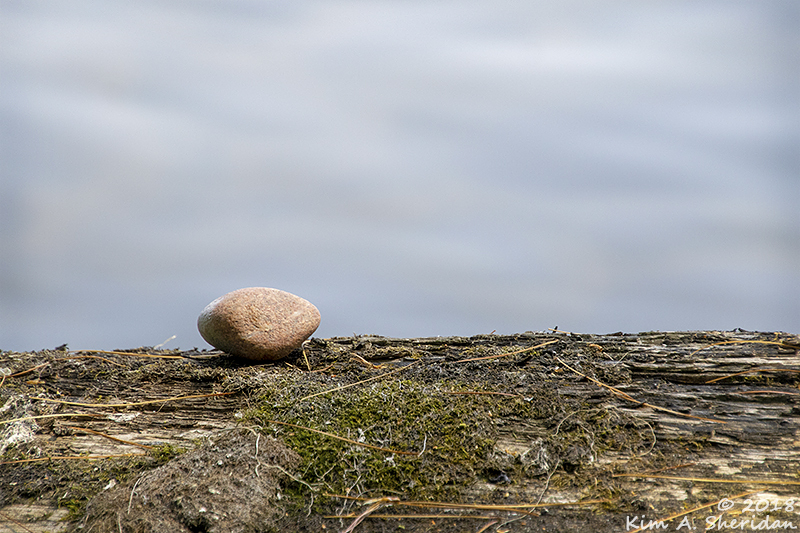 A pebble perched on a log just so, begging to have its portrait taken. 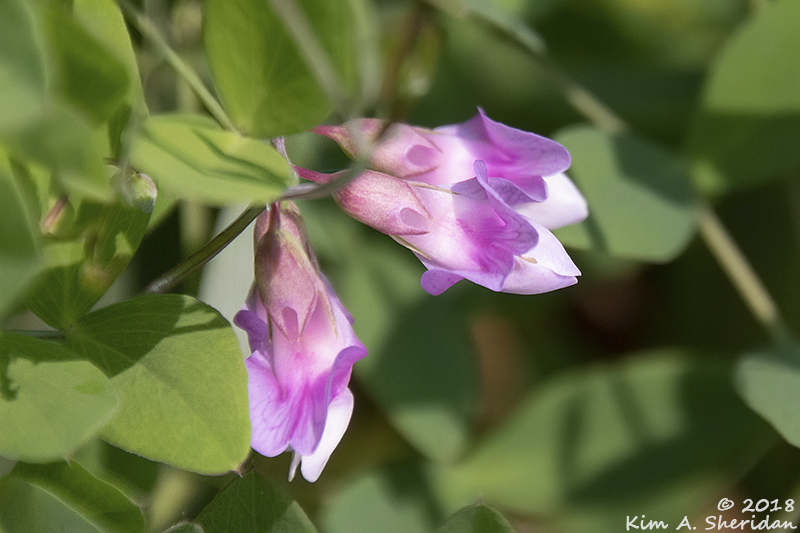 Little pink flowers bloomed along the trail’s edge. Storms along the Lake Michigan storm can take their toll on trees. A pine stood tall and proud, while a deciduous tree barely hung on. 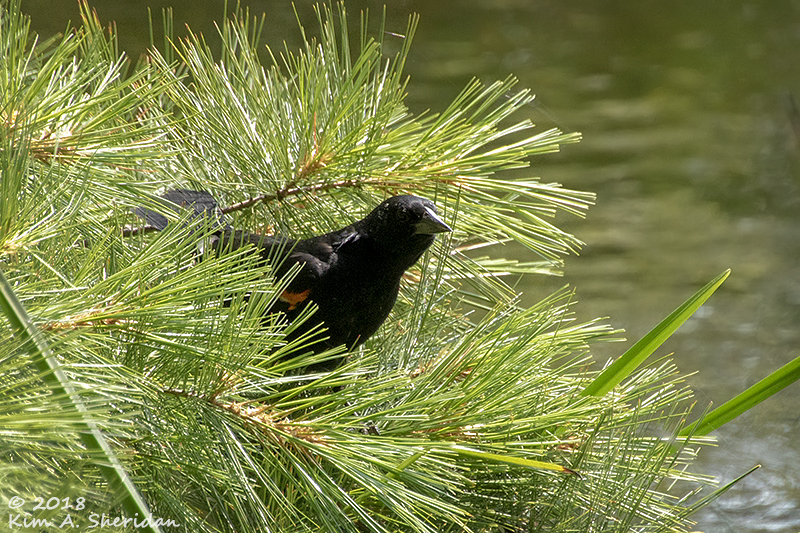 Back on the shores of Lost Lake, a noisy Red-winged Blackbird landed in the boughs of a white pine. As I came to the end of my walk, I saw the first portents of fall in a scattering of maple leaves. Even though it was only mid-August. 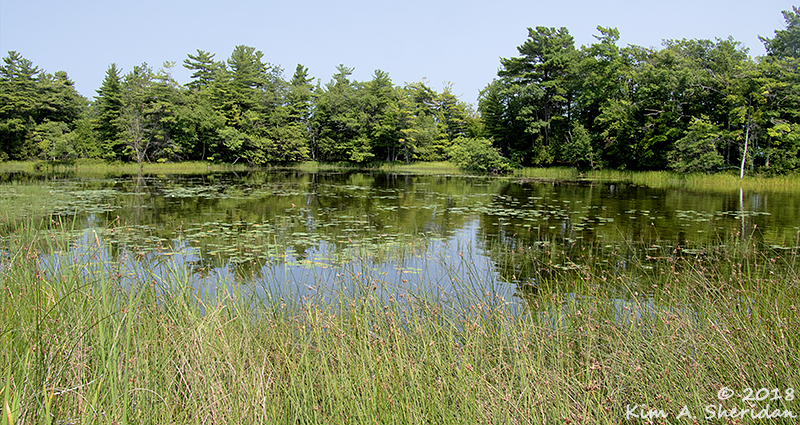 Three trails, three lakes, all in one walk. Three trails, three lakes, and me caught between them. That’s the wonder of nature in western Michigan. 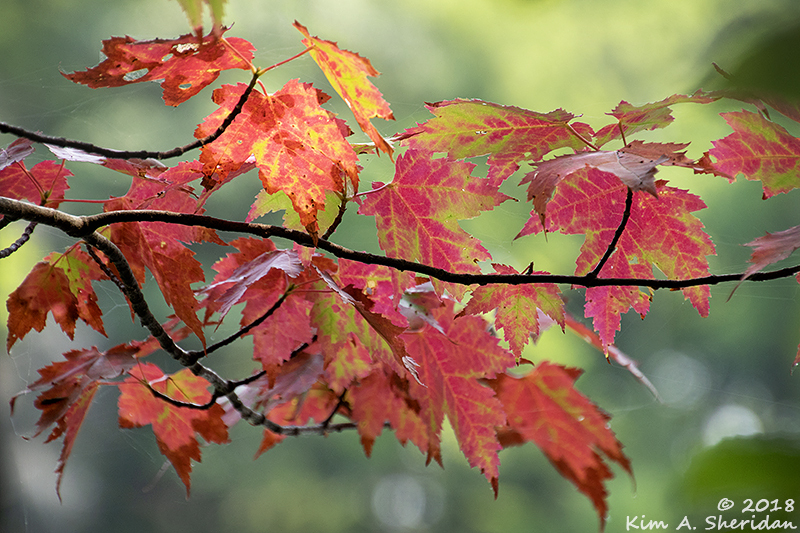 This entry was posted in Michigan, Nature and tagged Ludington State Park, Michigan, Nature by Kim. Bookmark the permalink. Thanks for sharing your hike, I enjoyed it.